The Memorial Tournament presented by Nationwide Insurance is annually one of the most prestigious events on the PGA TOUR – and one of the most challenging to win, especially for players who are trying to earn a TOUR victory for the first time. 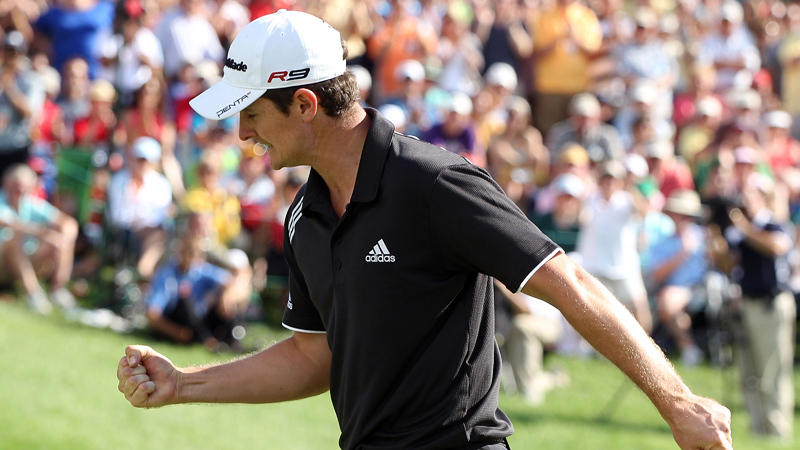 Of the 26 winners of the Memorial Tournament, only four men have conquered Muirfield Village Golf Club to record their first PGA TOUR title, so Justin Rose's triumph in the 2010 edition was truly an accomplishment. Keith Fergus in 1981 was the first breakthrough winner. Next Kenny Perry used his 1991 Memorial victory as a springboard to success. He now boasts a total of 14 PGA TOUR victories, including two more Memorial Tournament wins in 2003 and 2008. The last to accomplish the difficult task was Tom Lehman, who in 1994 set the 72-hole Tournament record of 268, 20-under-par. Overall Muirfield Village Golf Club, the polished and refined gem created by Memorial Tournament founder and host Jack Nicklaus, has proven to be an exacting examination through the years, and has seldom yielded to the uninitiated player looking for his first PGA TOUR title. From the onset, however, the 2010 Memorial Tournament seemed destined to produce another first-time TOUR winner to join that small and exclusive club. Enter PGA Tour rookie Rickie Fowler and Rose, both winless in their respective careers. Fowler and Rose emerged at the end of the first round of the 35th playing of the Memorial Tournament in a three-way tie for the lead with Geoff Ogilvy at seven-under-par. Fowler, the 21-year-old from California trying to become the youngest winner at Muirfield Village, remained atop the leaderboard for 48 consecutive holes until his tee shot on the par-3 12th found the water resulting in a double bogey. "I just made a bad swing and paid for it," said Fowler. Rose finished Round 2 in second place, three shots behind Fowler. He slipped slightly down the leaderboard on Saturday to start the final round in fourth place, four shots back of the lead. With a flawless Sunday performance Rose had one-putt greens on eight consecutive holes (11 overall) and played a bogey-free round to close with a 6-under-par 66 and win his first title in America. With his victory Rose, 29, became the first British golfer to win the Memorial. It was his seventh victory worldwide – Rose had previously won on five of the six major tours in the world - but his first on the PGA TOUR. Rose finished at 18-under-par 270, the lowest 72-hole score in the Memorial since Lehman set the record of 20 under 268 in 1994. It was a long time coming for Rose, who as a precocious 17-year-old finished fourth in the 1998 British Open at Royal Birkdale. He had struggles along the way, but that just made the reward – the moment – all the sweeter. "It's a great way to win," Rose said, "and to win here at the Memorial, at Jack's tournament, I couldn't think of a better place to win my first tournament."